I love shopping online from Black Friday until Cyber Monday. So you didn’t get all the deals you wanted on Black Friday. Don’t worry because we still have Small Business Saturday (which is today) and Cyber Monday. 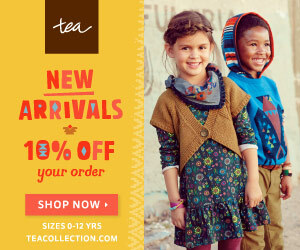 One of my fave kids clothing sites is having a Cyber Monday deal. Shop Tea’s Cyber Monday Sale! Get 30% off all Tea Collection styles + totally free shipping with code MONDAY! No minimum purchase required. Normally the clothes are pretty expensive but I wait for sales like this to grab a few pieces of their awesome clothes. Seriously. I keep building my little ones collections. My son has a green sweatshirt from Tea Collection that is one of his favorite shirts. It looks nice on him and it’s super soft. I love the long sleeve onesies for my daughter too. Previous PostPrevious PeekaPak Kids’ Subscription Box Black Friday and Cyber Monday Deal !! !